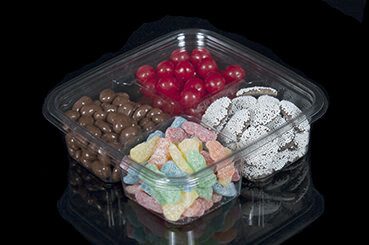 Panoramic Packaging is a leading provider of thermoformed rigid plastic products, ranging from food containers to WIP Plastic Trays. We offer a broad array of in-stock "stock line" package solutions, as well as full-service custom package design and engineering expertise. We believe that happy customers are the best customers. We take great pride in delivering spot-on solutions each and every engagement: in not only meeting, but exceeding, even the most demanding specifications. But it's not just our ability to perform day-in-and-day-out in the realms of engineering and production that keep our customers coming back for more. It is the fact that we don't just say we value our customers... we demonstrate it at every turn. Whether you choose us for a relatively small order or a massive job, we are absolutely committed to providing industry-renowned customer care. But don't just take our word for it. Ask one of our customers. And if you like what they have to say about us, we'd love to have an opportunity to make you a believer too! Our ISO 9001:2008 certified quality system controls the entire packaging life cycle from design to production, while offering valuable inventory and distribution solutions. And while the benefits of this fully-integrated manufacturing process are too extensive to list here, suffice to say that quality control and cost savings achieved through life-cycle process and project management efficiencies can be staggering. We make a point to focus on the little details. And time and time again, we find that it's in consideration of the details (such as designing with automation in mind from the start of a project) that the little (and not so little) efficiencies add up to demonstrable cost savings. We believe that continual innovation is a crucial ingredient reflected in our storied history and that an ongoing, uncompromising dedication to innovation is a critical component to our continued success. Our customers expect it and deserve it. And we believe that by demonstrating the real value of innovation to our customers with every engagement, we make one-time Clients long-time partners. Whether forward-looking best practices, the absolute best equipment, or the best and brightest talent available, we live innovation.